New Delhi: The Afghan President Hamid Karzai on Wednesday, Oct 5, unveiled his vision of the future of Afghanistan and South Asia. 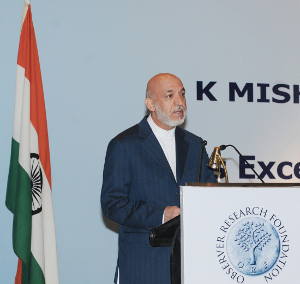 Delivering the third R.K. Mishra Memorial Lecture here, Karzai who signed an agreement on strategic partnership with India at his summit with Prime Minister Manmohan Singh, said Asia has a great potential for development and growth. He suggested the “European Model” to achieve this potential. Karzai expressed confidence that if Europe which had much deeper conflicts in history than that of Asia could harness its potential, South Aaisa too can achieve the miracle. The R.K. Mishra Memorial Lecture was organised by Observer Research Foundation (ORF) in memory of its Founder Chairman. Excerpts from the speech: I am not going to go way back into the past today. I will begin from 1977-78 or more precisely 1979 with the Soviet invasion of Afghanistan and the consequences that invasion brought not only to Afghanistan but to the wider region. A brief description of Afghanistan at that time will lead us to where we are today. Afghanistan was a poor, mostly illiterate, central South Asian country with deeply believing Muslim people with quite good minorities of Hindus and Sikhs and some Jews living in that country where the society was deeply believing in Muslim, where the society at the same time was traditional and moderate, where the society lived as the tradition in that part of Afghanistan, and in parts of India is, in a panchayat type of system where there was an egalitarian culture where the Khans and the Lords and the Maliks were not much above the farmers and those that helped them or served them when they sat around the dinner table or dinner cloth as we call the strahan, I am sure you call the same in India, and other occasions, where education was on the rise, where the society was beginning to be more affluent and more educated, where a civil service was taking shape, where governance was taking the modern shape as we have now experienced in the past two or three centuries in the rest of the world. In this environment, the Soviet Union came to Afghanistan and with the invasion of the Soviet Union, the Afghan people rose and resisted that foreign occupation and to the imposition of communism as a way of life on the Afghan people. The reaction to that was the jihad of the Afghan people, the resistance of the Afghan people as the French called it at that time and also equally an imposition in the name of the jihad of the Afghan people by other foreign forces of religious radicalism on the Afghan people. So, Afghanistan was confronted by two opposing political trends, one using communism as a tool, the other using and promoting religious radicalism as a tool. One using that tool to defeat the so called non-communists and the other using the tool to defeat the so called communists. In this tussle, Afghanistan suffered heavily. In this war, which was a war of liberation for the Afghan people, but a war of purposes other than that for countries in the region and the West and the Soviet Union. We all know the story till 2001 and beyond. With the arrival of Taliban and with September 11, the West woke up or perhaps the right word would be, began to see their interests more present and eminently of danger to them in Afghanistan. They came to Afghanistan and as we saw the West led by the United States of America and NATO succeeded in removing the Taliban and Al Qaeda and their foreign backers within a month and a half. I was personally present there in Afghanistan at that time and a witness to what happened and that is of extreme importance to the audience today. The Taliban and the Al Qaeda and their foreign backers in Afghanistan were defeated not because only of the arrival of the NATO and American forces. They were defeated because of the deep desire of the Afghan people to free themselves, because of the deep desire of the Afghan people for liberation. When the Taliban and Al Qaeda and their backers were removed from Afghanistan within a month and half, it was when there was no American forces on our soil. There were only perhaps 500 of them altogether and definitely not in the Southern parts of Afghanistan where the Al Qaeda and the Taliban had strong presence. It was the community that rose against them, that pushed them away and they left. Subsequent to that, from 2001, Afghanistan began to re-emerge as a country for all Afghans, while before that whoever was the government claimed total ownership of Afghanistan. If it was the Communists they said all is ours, if it was the mujahideen parties who came they fought among themselves and brought ruin to themselves and to the country and the Taliban of course was totally exclusionists. The Afghanistan of today is the Afghanistan in which all Afghans find their place. It is a place for all Afghans. So, that is the greatest achievement of the past decade of work. In this decade, we began not only to make Afghanistan once again the home for all Afghans but also to bring back to Afghanistan the repair of the destruction of the two previous decades. Bring back a civil service, bring back an economic recovery, bring back the build up of the institutions, bring back democracy, bring a constitution and most important of all, the return of women to the Afghan polity and work place and education. I will come back to India in this connection later on, but before I go further I would like to once again make a note of thanks to the people of India for having participated in every aspect of this rebuilding of this country. In every aspect, from democracy, institution building, to education, to highways, to transmission lines for power generation, for electricity, to the thousands of scholarships to the very well spent, nearly 2 billion dollars of assistance in our country. So, thank you very much and I will return to the subject later on. This is what we achieved. But this achievement of Afghanistan came in spite of all the obstacles and odds. The war machinery against Afghanistan, terrorism, extremism did not stop. Those who came from the rest of the world to help us, their financial contributions mattered greatly but also their presence in Afghanistan brought the unintended consequences of parallel structures, private security firms and all other activities that caused an impediment to the growth of the Afghan State. So, Afghanistan has grown to where it is today, where we have nearly 70000 students in our universities, nearly 7.5 million children in our schools, and a massively free press where you can’t imagine in India, because India is too focused on its own as far as the media is concerned. You don’t look beyond India. When you look beyond India into the region, the Afghan Press is perhaps as vibrant, if not as entrenched in culture of media freedom as India is, but it is as vibrant and as abusive of the government as yours. This is a significant achievement and we will continue with it and I will come to the vision part of it later on. In this whole exercise for the rebuilding of Afghanistan, as I referred to in my remarks earlier, India, as it was a contributor in the past, became even more of a significant contributor in the past 10 years. It never said no to any of Afghanistan’s requests. It fulfilled. When I asked the Prime Minister Dr Manmohan Singh for more scholarships, he said yes. When I asked the Prime Minister Mr Atal Bihari Vajpayee before him for roads, he said yes. The two governments that I have seen since my Presidency in Afghanistan have given us all that we wanted. Yesterday, we signed a strategic partnership agreement. It is nothing new by the way. We have been engaged in strategic partnership cooperation for the last many years. When you gave us 2000 scholarships, that is strategic. That is extremely strategic when you train our youth in your universities. When you built a brand new road from the South West of Afghanistan to the West of Afghanistan, the Zaranj-Delaram road, that brings a massive change to trade and transit and the livelihood of people, that is strategic. When you build the transmission lines from Northern Afghanistan to the capital of the country and beyond, that is strategic. When you build the Parliament of the country, that is strategic. When you give us 2.5 billion dollars, that is strategic. So, yesterday we put in words and signed the strategic cooperation that we have had and this will now encompass security, capacity building, economic activity further in the mineral capacity building and exploration in oil and gas and all other fields. So, taking this occasion, thank you very much India for what you have done for us and surely the Afghans will not only not forget this but will remain grateful forever for what India has done for us today and for this very important step that we took to formalise this relationship yesterday. As I mentioned earlier, Afghanistan’s rebuilding effort concentrated on all the aspects of our life. I mentioned briefly the obstacles that we faced. In order to give you a picture of these obstacles in a little more detail, and then to take a step further into the peace building efforts and to the transition, I would like to tell you that in the past 10 years as we were building schools, the terrorists were coming and burning our schools. As we were building the traditional society of Afghanistan bringing back life to the political culture of the country, the terrorists and those from outside were killing our leaders, national leaders to community leaders to local leaders. As we were building mosques and Islamic institutions, our Ulema were being killed and maimed and muted. As we were training teachers, our teachers were being killed and intimidated. As we were building health institutions, doctors were killed and clinics destroyed. Hundreds of community leaders have been killed. Thousands of police and soldiers have been killed. Thousands of our civilians have lost life to various forms of violence. Hundreds of schools were shut down or destroyed. The roads that we built were damaged again by violence and terrorism. So, where Afghanistan stands today, a country where in 2001, in 2002 rather, where we had an income per capita of 150 dollars, today we stand at 600 dollars; where we had a GDP of 3 billion dollars, today we stand at perhaps close to 18 billion dollars, above 17 billion dollars; where we had a foreign reserve of a mere 180 to 200 million dollars, we stand nearly 6 billion dollars today; when we had no schools, in spite of the violence we have thousands of schools; where we have no advancement in any other part of the country or areas of development, Afghanistan stands good and solid; where Afghanistan was totally taken by polio and malaria, and mother and child mortality, Afghanistan has done magnificently well, in that Afghanistan has received the appreciation of the United Nations in this fight against polio and the mother and child mortality rates which have come down considerably. But where Afghanistan has not succeeded is to bring security to its people. Where Afghanistan has not succeeded is bring peace to its people. Where the international community, NATO and the United States have failed in bringing peace and stability to the country. What is the reason for that is the most important question for us all. Because it is not only Afghanistan that suffers. Afghanistan suffers a lot more, but so does India in the hands of terrorism, so does Pakistan in the hands of terrorism. Pakistan suffers more today than we do in Afghanistan. Much more. Just yesterday, 13 people were killed in Quetta in some form of sectarian killing. In the beginning, from 2002 to 2005-06, I was highly vocal in condemning violent activities as we felt was coming from across the border into Afghanistan. But when I saw that Pakistan too was beginning to suffer in a very serious way from extremism and radicalism and the consequences of that in terms of violence and the loss of life for the people of Pakistan, I began to change my attitude and my rhetoric. Since then, from 2005-06, ladies and gentlemen, no government in Afghanistan, since the creation of Pakistan 64 years ago, has engaged as extensively and with strong focus as I and my government have done, by launching a peace process with the Taliban and by engaging directly and very sincerely and very brotherly with our brothers in Pakistan. We have not unfortunately yet received the result that we wanted. What we wished has not yet been fulfilled. In the peace process with the Taliban, a messenger who came in the name of peace killed Professor Burhanuddin Rabbani — a suicide bomber. He came to bring us a message of peace and he was killed. Professor Rabbani was killed by the same messenger of peace. Therefore, we have now decided to not talk to the Taliban because we don’t know their address, we don’t know where to find them. And when we find them, we will talk to them. Therefore, we have decided to talk to our brothers, our neighbours in Pakistan. In all sincerity, desirous of results, we will continue to work with our brothers in Pakistan. This relationship, as we began years ago, has unfortunately not given us the result that we want. So, the peace process as it stands today will be focused more towards in relations between countries rather than on us seeking a dialogue with an organisation or a body of individuals that we cannot find. In this quest of ours for security in Afghanistan, Afghanistan has not only engaged in the most brotherly terms, in the most friendly terms, the relations with our friends and brothers in Pakistan but also with Iran and also with our other neighbours, which we will continue to do. In the same exercise in bringing stability and strength to Afghanistan, as we signed an agreement with India for strategic partnership, Afghanistan is also in negotiations with the United States of America. Afghanistan has already signed one with NATO and Afghanistan is looking at an agreement with the European Union. So, Afghanistan can provide for itself the means of stability and the means of capacity building by arrangements with the international community in the neighbourhood of Afghanistan and beyond the neighbourhood of Afghanistan. In this connection, the most important development that is of relevance not only to Afghanistan but the region is the transfer of authority from the international community to the Afghan forces, particularly from NATO to the Afghan forces. We began this transfer of authority last July, the first tranche of it in seven Afghan cities and provinces. The next tranche is to begin in the month of October and I will be announcing it soon after my return to Kabul which will continue to be implemented towards the third tranche and the final by 2014 which we were trying to cut short and make it take place by 2013. This means that by 2013 or maximum by 2014 Afghanistan will be entirely responsible for its own security. Afghanistan will be entirely responsible for the protection of its borders. Afghanistan will be entirely delivering services and all other governmental and state functions to its people. Afghanistan would be looking after its affairs in short entirely on its own, in cooperation and collaboration with countries like India, Europe, the United States, Saudi Arabia, Japan, Russia, China, of course all our other neighbours. This is a process that I hope India and all our other neighbours of ours will support and back as we move forward. Transition and the implementation of transition of authority to Afghanistan will bring us rather in a dramatic way, head to head with what it is that we aspire for the region. Can Afghanistan, can India, can Pakistan, especially these three countries, and our other neighbours continue life as it is today? Can we feel threatened as we move to the future? Can we live in the same environment of insecurity and fear as we do today? I was earlier talking with His Excellency the Vice President Mr Ansari and I told him can you tell me how many children in India, in Delhi, know about flares that are fired from helicopters and planes as they pass by. How many children in India or in the rest of the world would be playing the suicider game and the other person’s game who are trying to protect themselves. How many children in the world would be knowing the name of Chinooks and Black Hawk helicopters. The children of Afghanistan know, and in Pakistan too. How many children in the world, do we have any child in the world that will play like we saw recently in a video in Pakistan where one child becomes a suicide bomber and the others are the victims and they play this game. This is a tragic scene, extremely abusive of humanity, extremely abusive of humanity where our four year old boys talk of suicide bombs. I have heard my own son many times, when I come home, he says, daddy, did you hear the suicide bomber. I tired to change the subject but he would not give up, he will keep asking. Is this the region that we want to live in? Definitely not. So, if we don’t want to live in a region filled with violence, anger, aggression, what is it that we should do? As I mentioned earlier, we have done our best, the best that is humanly possible with our neighbours and we will continue to do the best that is possible with our neighbours. But this region with this massive potential of growth and it is being seen as we see it in India fortunately, this massive growth that you have, as we see it in China, has a great story of success visible to the whole world, and yet at the same time this region has the most negative trends affecting us as well. On the one hand there is massive potential of progress and activity towards a better living and on the other hand there is so much violence, so much aggression, so much extremism coming to us. If this trend continues as it is, years from today not only we will be faced with increased threat and less development but we will have as we do have today water shortages, shortages of space and land, shortages of vegetation and forests, and all other difficulties that will confront us in a very daring and challenging manner. I don’t think, ladies and gentlemen, that we can afford as human societies by the standards of the so called sophisticated war seekers. I don’t think we can afford to live as human societies in this environment of hatred and lack of trust. For Afghanistan we have no option but to be the best of brothers and friends with our neighbours, to be a transit route, to be the hub of commercial activity for this region and to have freedom of movement. For this region there is no way that we cannot copy the European model of living side by side in peace and prosperity. Europeans have had bigger conflicts than we have had in the histories of our countries. My vision for this region is one in which there are no borders or lax borders. My vision for this region is where our youth’s energy is released and spent for the wellbeing of the future generations. My vision for this region is of more prosperity and of peace. My vision for this region is where the grand children will not be talking of suicide bombs, they will not know suicide bombs, and they will be talking of anything else. That vision will not come unless we all recognize that we need bold, visionary steps and leadership. In the past 10 years I have been witness to efforts by India and Pakistan, one that began by Prime Minister Atal Bihari Vajpayee and Prime Minister Nawaz Sharif, the other that began by Prime Minister Manmohan Singh and Mr Gilani. I appreciate both the efforts. As I talk to them Nawaz Sharif, Mr Vajpayee, Prime Minister Manmohan Singh, Mr Gilani, are as much desirous of peace as anyone of us in this room and beyond. I hope the polity as a whole can get together and go beyond the established tendencies, and Afghanistan will spend no stone unturned, Afghanistan will not fall short of any measure that brings that. So, Afghanistan’s grapes can reach you not on a plane, on an IL-76 or something like but in a truck from Kabul to Delhi, as delicious and fresh as they are in Kabul or in Kandahar or in Jalalabad. So, we can have eventually the vision of Dr Manmohan Singh where we can have breakfast in Amritsar, lunch in Lahore, dinner in Kabul and perhaps the next breakfast in Tehran. This is the vision that I have and this is surely the vision of the millions and millions of inhabitants that this region have. I will continue to work in tremendous and honesty with our brothers in Pakistan. The signing of the strategic partnership yesterday with India I must emphasise and reemphasise is not directed against any country, is not directed against any other entity. This is for Afghanistan to benefit from the strength of India. India fortunately has the strength to help us. This is for Afghanistan to use the possibilities that India has and offers to make our life better, to educate our children, to train our police, to train our army, to train our physicians, to train our lab technicians. The strategic partnership that we have is to support Afghanistan develop. I am sure this partnership will benefit us. My plea today is that we grow beyond the environment of lack of trust, if not hatred. For me, the vision for the future is what this region has. Ladies and gentlemen, if you look closer this region is in terms of its people more assembled, more united, more culturally together than any other region. Do you have in Russia, a great German poet? No. Do, we have in Italy, a great French poet? No. But we have in India, Bedil, a great Persian poet, but we have in Pakistan Iqbal a great Persian and Urdu poet. Do you have anywhere in the world where in a distance of thousands of kilometres someone like Tagore writing about the life of a merchant in the other country of that region? No. But Tagore has written Kabuliwalah. Do you have in any other part of the world a singer like Lata Mangeshkarji who would listen to Mehdi Hassan or Mehdi Hassan who would listen to Bhimsen Joshi, or Kushal Khan Khattak who would speak of the beauty of India. Our Ghalib would be read by all of us, from the shores of the Arabian sea to the other end of this continent. Ask any Afghan, they will tell you about Shah Rukh Khan, ask any Afghan they will talk about Shammi Kapoorji, the late Shammi Kapoor. Ask any Pakistani, they would love the Indian songs. Ask any Indian, they would love Nusrat Fateh Ali Khan. This is the foundation that we have and this is the foundation upon which I hope with tremendous aspirations that we can build towards a future where we can be not only peaceful but very prosperous countries, prosperous people, where I can as a retired citizen of Afghanistan also be a retired citizen of South Asia. That is my dream and thank you very much. This entry was posted in AfPak region, News and tagged Af-Pak region, Central Asia, Iran, militancy, Pakistan, Strategic Partnership, terrorism. Bookmark the permalink.